This piece of jewellery is fun, wearable and contemporary. 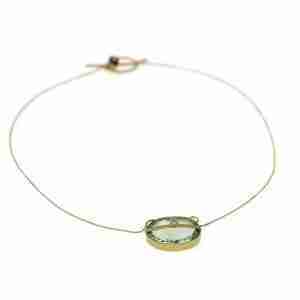 The pendant is made in ethical sterling silver with pale transparent mint coloured sparkling, green quartz stones. You can wear the jewellery during the day or for the evening. Would you like to make an inquiry? You can contact farah@farahqureshi.co.uk for further information. Delivery times are between three to four weeks. Dare to be different? These cufflinks are made with both men and women in mind and are made in 18 carat ethical gold with colourful gema, they are inspired by botanical imagery. 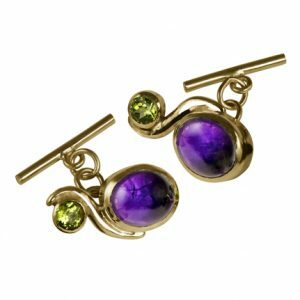 The cufflinks are embellished with sparkling apple green peridots and glossy grape coloured amethysts. Would you like to make an inquiry? You can contact farah@farahqureshi.co.uk for further information. 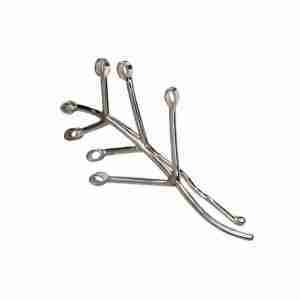 The cufflinks can take between three to four weeks to make and dispatch. 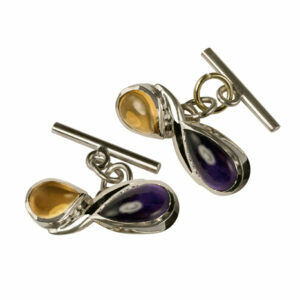 The cufflinks can also be made in gold plated silver at a different price. A stylish and subtle hair accessory made in polished, sterling ethical silver, which has been inspired by visits to botanical gardens. Would you like to make an inquiry, please contact farah@farahqureshi.co.uk, for further information. The hair jewel takes approximately three weeks to make and send. Dare to be different? These cufflinks are made with both women and men in mind and can be worn by either ladies or gentlemen. They are hand made in London using ethical silver and have contrasting coloured gems, honey yellow citrine sits opposite grape coloured purple amethyst gems in elegant glossy pear shapes. The cufflinks are inspired by botanical imagery. Would you like to make an inquiry? You can contact farah@farahqureshi.co.uk for further information. 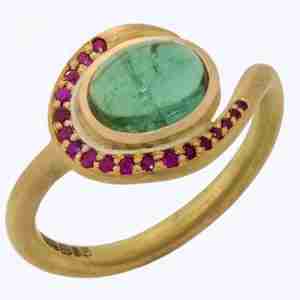 This is a glamorous and wearable ring made with a sea green glossy tourmaline and berry red rubies made in 18 carat ethical gold. Its a great piece to wear everyday. Would you like to make an inquiry? You can contact farah@farahqureshi.co.uk for further information. The ring can take up to four weeks to make and send. 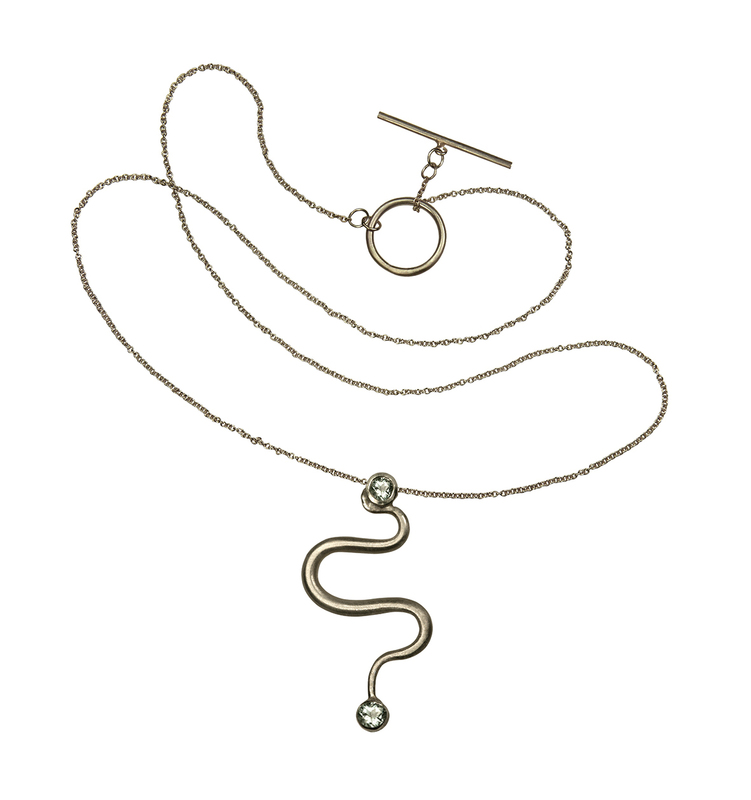 This is a great heirloom piece, made in eighteen carat ethical gold. 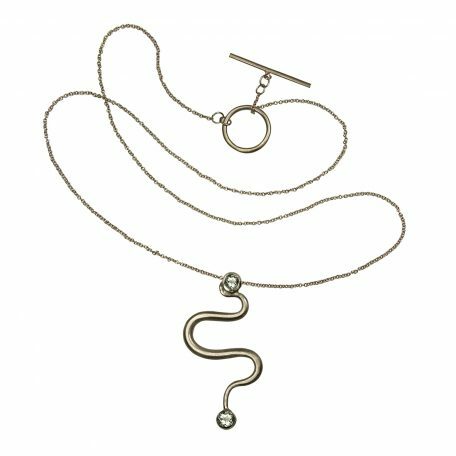 The luxurious pendant is made with a pale mint transparent green quartz and ice white diamonds, there is also a red berry coloured sparkling garnet on the catch. Would you like to make an inquiry? You can contact farah@farahqureshi.co.uk. The pendant, can take up to four weeks to make and send. These earrings can be described as quirky, fun and wearable. 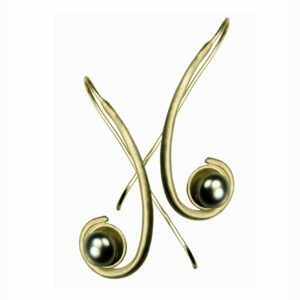 The earrings are made in ethical sterling silver with velvet grey coloured Buton pearls. 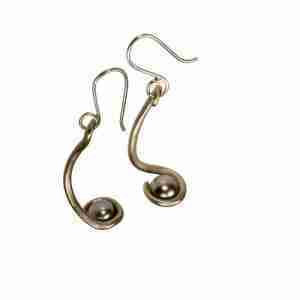 They would be great worn for day wear or can be dressed up with more pieces of jewellery for the evening. Would you like to make an inquiry? You can contact farah@farahqureshi.co.uk. Delivery times are between three to four weeks.